Fly By Nites at the end of Wesley Street outside of Pie Bents (Bentleys Pie & Peas) and Laycock’s Newsagents. From left to right Harry Clayton, assuming his usual position commonly known as the collier’s cronk, Floyd Curtis and Cliff Glover, formerly of Dewsbury R.L.F.C. It is said that Harry Clayton was hardly ever seen elsewhere and usually took up the position, geographically and physically, shown in the sketch. Flushdyke folklore has it that a friend of Douglas Brammer’s was once stopped in Flushdyke by a driver seeking directions to Station Road. The route was explained to the driver and he was advised to take the next left on to Dale Street and then carry on and turn left at Harry Clayton. The truth of the story has not been corroborated. 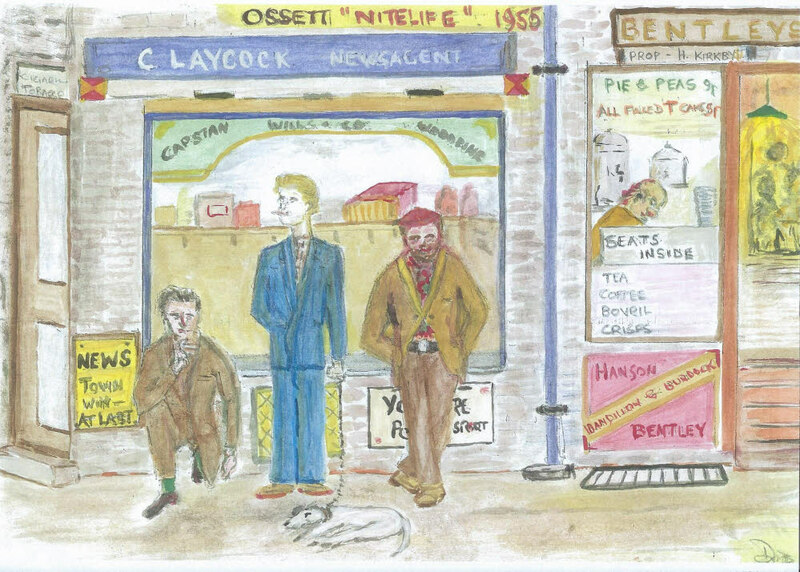 Bent’s Pie & Peas shop was a popular haunt following an evening at Ossett’s Palladium Cinema situated on the opposite side of the Market Square. It was either Bent’s for Pie & Peas or the Cabin for Fish & Chips.